On the basis of type, the market has been segmented into synthetic betaine and natural betaine. On the basis of form, the market has been segmented into betaine anhydrous, cocamidopropyl betaine, betaine monohydrate, and others. On the basis of application, the betaine market has been segmented into food & beverages, animal feed, cosmetics, detergents, and others. On the basis of region, the market is segmented into North America, Europe, Asia-Pacific, Latin America, and the Rest of the World (RoW). The betaine market is estimated to grow with its increasing application in food, feed, and other industries such as cosmetics and detergents. As an additive in animal feed, betaine helps in imparting nutritive value by supporting the functionality of nervous system and also helps in brain development in animals. Betaine has a wide range of applications in the food industry as it helps in the dietary functions and is used in nutraceuticals to prevent heart and liver diseases. It is also accepted as an anti-stressing agent and is found to improve athletic performance. The health benefits of betaine are estimated to increase the number of applications of betaine in the global market. The demand for betaine in the cosmetics market is also driven with the introduction of new products that have safe natural ingredients. Betaine, being a mild surfactant, causes less eye and skin irritation. Hence, the key players in the industry use betaine in shampoos and cosmetics as an emulsifier, surfactant, and as an anti-static agent. 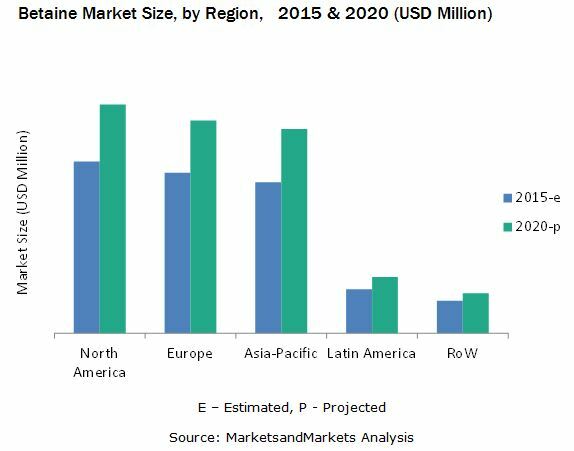 The market for betaine is projected to reach USD 3.89 Billion by 2020. In 2014, North America was the largest and Asia-Pacific was the fastest-growing market for betaine. The North America betaine market was closely followed by Europe, Germany being the major revenue contributor in the region. North America is projected to be the second fastest-growing market after Asia-Pacific for betaine during the forecast period. The global betaine market is expected to grow in the near future owing to factors such as increasing application of betaine in personal care industry and rising potential of betaine in the animal feed industry owing to the health benefits associated with it when consumed in recommended levels. The report includes key strategies, along with the product portfolio of the leading companies in the market. It includes the profiles of the leading companies, such as Associated British Food plc (U.K.), BASF SE (Germany), DuPont (U.S.), Nutreco N.V. (The Netherlands), Solvay S.A. (Belgium), American Crystal Sugar Company (U.S.), Amino GmbH (Germany), Kao Corporation (Japan), Stepan Company (U.S.), and Sunwin Chemicals (China). The key players in the market are focusing on new product developments, acquisitions, joint ventures/ agreements, and expansions & investments of their production facilities to strengthen their position in the global betaine market.